This client reached out to us after going through a difficult life transition. 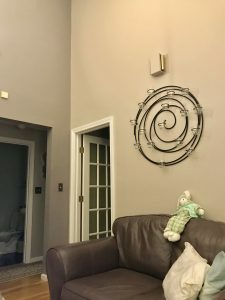 She wanted to change her home from something that brought her feelings of frustration to a warm stylish space that embraced her new independence. She wanted the home to be a reflection of herself and the things that brought her joy. The first step of the process was getting to know this client, her likes and dislikes, her style, and the pain points of her current home. 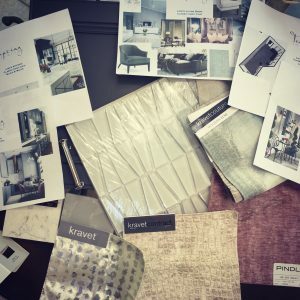 We pulled together all the elements step by step until we had fabrics, colors, layouts, furniture, and design schemes for each area of the home. What developed was a gorgeous blend of classic and contemporary updates with a touch of glam throughout! 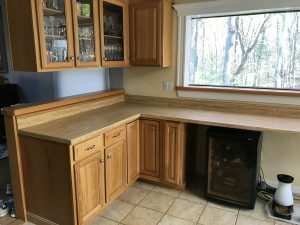 We corrected issues with the kitchen and added some cabinetry, but primarily refaced the remaining existing cabinets. The kitchen was transformed entirely with a rich charcoal cabinet color, glass backsplash, and a waterfall edge quartz countertop. 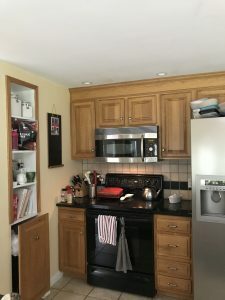 The entire first floor was repainted including a fresh new bold blue for the exterior wall which remains in place over the kitchen and sunroom. We designed custom furniture and picked out the perfect pieces to fill the living room and other sitting areas. We created rich custom drapery panels to bring in a bit of luxury. The finishing touches were the crystal lighting fixtures, a wall-mounted fireplace, and luxurious fabrics on pillows and throws. The final product was a totally updated, comfortable, and glam oasis for our client to enjoy! We Won Best of Houzz 2019 & 2018!